The City of Lambertville announced Monday that it has received the Sustainable Champion award, Sustainable Jersey’s highest honor, for attaining the most points in the organization’s certification program for towns with a population under 5,000. Mayor Dave Del Vecchio accepted the award on behalf of the city at Sustainable Jersey’s annual luncheon held last week in Atlantic City. Lambertville achieved a “silver” level, with 350 certification points– an upgrade from its previous “bronze” designation. The accreditation recognizes Lambertville’s work on 32 separate activities across 14 different categories. Lambertville’s score improvement is due to the city more than doubling the amount its sustainability work as compared to previous certification cycles. Del Vecchio thanked the Lambertville Environmental Commission for all their hard work on this initiative. · Community Forestry Plan with a Tree Cover Goal of maintaining Lambertville’s tree canopy to at least 50%. Sustainable Jersey provides tools, training and financial incentives to support communities as they pursue sustainability programs. 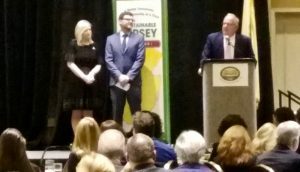 Currently, 79 percent or 448 of New Jersey’s 565 municipalities are participating in the municipal certification program and 310 school districts and 799 schools are participating in the Sustainable Jersey for Schools certification program.